It’s the age-old bridal question of what style gown suits my body shape. And I am here to throw that thought out the window and tell you to stride in to your bridal gown shopping with an open mind. Yes, I understand we all have certain dress styles and clothing options that we lean to but an off the rack dress is not your wedding dress and what you choose to wear day to day may not translate into a wedding gown. Check all your preconceived thoughts at the bridal door and be ready to have some fun discovering the gown that suits your shape and style. For most of us, a ballgown is an extremely foreign concept, we see them on the red carpet and we think of Cinderella. I hear the refrain “I don’t want poofy” at least once a day. And let me tell you, at least half of those brides choose a ballgown they are head over heels over. A ballgown creates a tiny waist, gives you a feeling of lightness, elevates your stature and makes you the belle of the ball. 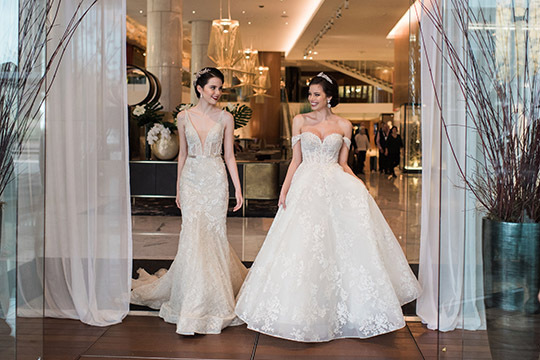 There are so many types of ballgowns, from avante garde Vera Wang with her delicious layers of textures and fabrics, to Hayley Paige’s flirty and fun designs and Berta’s magnificent glittering showstoppers. Can look good on a curvy bride! The common thought here is that mermaids and trumpets only suit perfectly proportioned ladies (and what is “perfectly” proportioned?) or slim ladies. I am here to say curvy brides can look fantastic in a trumpet with the proper structure and cut. 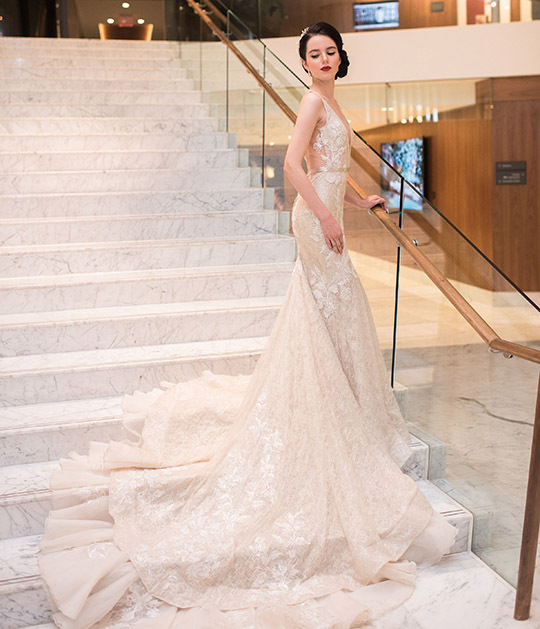 Many designers are now incorporating Spanx-like bodysuits into their fitted gowns, like Berta Bridal, or creating structure to comfortably lift and smooth where need be like plus-size Studio Levana. Mermaids look fantastic on curvy brides who are proportionate, emphasizing the bust and booty and cinching the waist. Sheaths are darling at the moment, especially in a beautiful crepe or satin. No need to be Gigi Hadid to pull this sleek and elegant style on your wedding day. True, sheaths are more suited to straighter and taller frames but if a sheath is in your pinned favourites and you’re worried about smoothing, opt for a thicker crepe or multi layered fabric. My favourite is by Vera Wang, her crepe is decadently rich and thick and smooths like butter. Not feeling too confident about a full sheath, go for mixed fabrics, try an embroidered top with a sheath bottom by Pronovias. Absolutely an A-line looks good on almost any body shape and they come in so many different styles and permutations of fabrics. A-lines with their softer line over the hips is flattering and forgiving on all body shapes. The world is your oyster when it comes to A-line gowns, from romantic and soft gauzy tulle, clean matte satin, gorgeous embellishments. Each body shape can create their own signature whether it be with neckline choices, sleeves, impressive back details (or no back at all), illusion necklines, and more. The best advice, trust your consultant and keep an open mind. You may not love everything that you try but that is part of the process, don’t get disheartened, listen and learn and communicate your thoughts. I always advise to let your consultant know what you are leaning towards but let her run the appointment and sit back with your family and friends and enjoy the process. At Blush, all of our consultants come from a design and/or fashion degree background, so they know their bridal gowns! Monti has been in the fashion and hospitality industry for 20+ years, and continues to live and love every aspect & moment of it. 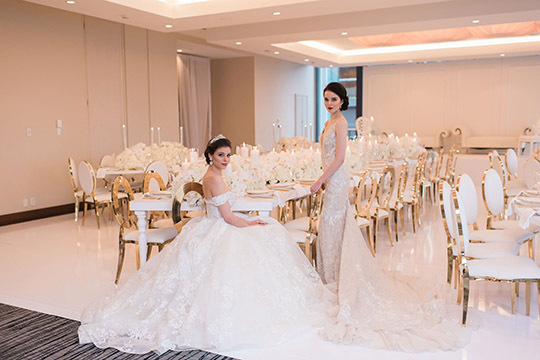 An amazing professional whom you will instantly trust to help you find your perfect gown. A huge promoter of local wedding businesses in Vancouver, her goal is to create a supportive environment for all to succeed. She comes from an international background having lived, worked and studied in North America, Europe, Asia and the Caribbean and brings this experience and knowledge into the salon and to the bride. Pick a country and location for your wedding and she has likely been, lived or planned a wedding there, so make sure to ask!